Another sign we are on the cusp of the next grand minimum? 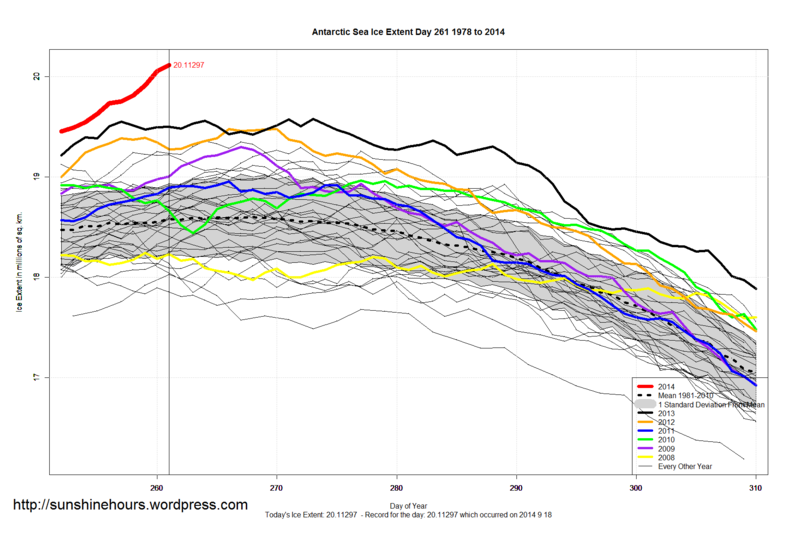 Antarctic Sea Ice Extent Sep 19 2014 – 1,535,000 sq km above the 1981-2010 mean. Data for Day 261. Data here. Another 58,000 sq km. 7th All-Time Record in 7 Days. 610,000 sq km higher than the previous daily record. Does the ice extent on both poles simultaneously expand during a Grand Minimum or do underwater volcanoes in the Arctic have a role in the growth of the sea ice?